City of Babylonia, situated at or near the junction of the Euphrates with the Nahr Malka; one of the earliest centers of Babylonian Judaism. As the seat of the exilarch it traced its origin back to King Jehoiachin. According to Sherira Gaon (Letter of Sherira Gaon, in Neubauer, "M. J. C." i. 26), Jehoiachin and his coexilarchs built a synagogue at Nehardea, for the foundation of which they used earth and stones which they had brought, in accordance with the words of Ps. cii. 17 (A. V. 16), from Jerusalem (comp. a similar statement in regard to the founding of the Jewish city of Ispahan, in "Monatsschrift," 1873, pp. 129, 181). This was the synagogue called "Shaf we-Yatib," to which there are several references dating from the third and fourth centuries (R. H. 24b; 'Ab. Zarah 43b; Niddah 13a), and which Abaye asserts (Meg. 29a) was the seat of the Shekinah in Babylonia. The Aaronic portion of the Jewish population of Nehardea was said to be descended from the slaves of Pashur ben Immer, the contemporary of King Jehoiachin (Ḳid. 70b). There are also other allusions in the Talmud (ib.) casting doubt upon the purity of blood of the Nehardean Jews. The fact that Hyrcanus, the high priest, lived for a time in that city as a captive of the Parthians (Josephus, "Ant." xv. 1, § 2) may explain the circumstance that as late as the third century certain of its inhabitants traced their descent back to the Hasmoneans. The importance of the city during the last century of the existence of the Second Temple appears from the following statement made by Josephus (ib. xviii. 9, § 1): "The city of Nehardea is thickly populated, and among other advantages possesses an extensive and fertile territory. Moreover, it is impregnable, as it is surrounded by the Euphrates and is strongly fortified." Reference to the extent of the territory of Nehardea is made in the Talmud also (Ket. 54a). In addition to the Euphrates, the "King's Canal" (Nehar [Nahr] Malka) formed one of the natural defenses of the city (Ḳid. 70b; Shab. 108b); the ferry over the river (or perhaps over the canal) is likewise mentioned (Ḳid. 70b; Ḥul. 50b). "Nehardea and Nisibis," says Josephus further (ib. ), "were the treasuries of the Eastern Jews; for the Temple taxes were kept there until the stated days for forwarding them to Jerusalem." Nehardea was the native city of the two brothers Anilai and Asinai, who in the first third of the first century C.E. founded a robber-state on the Euphrates, and caused much trouble to the Babylonian Jews. 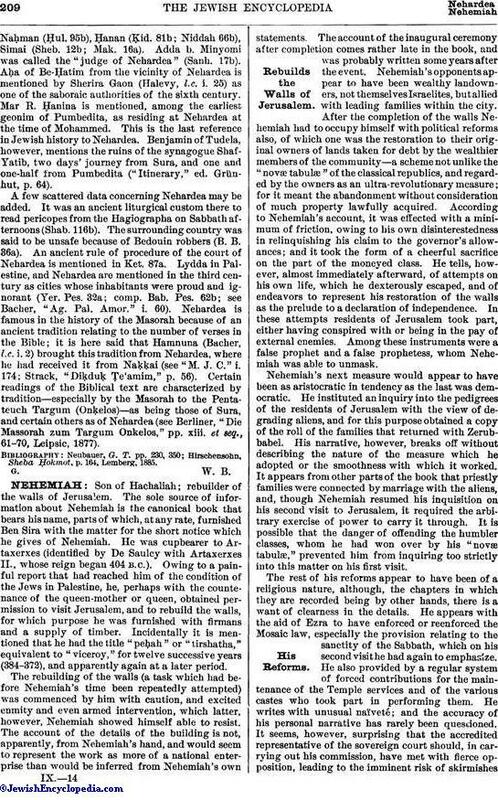 After the destruction of Jerusalem, Nehardea is first mentioned in connection with R. Akiba's sojourn there (Yeb., end). From the post-Hadrianic tannaitic period there is the anecdote referring to the debt which Aḥai b. Josiah had to collect at Nehardea (Giṭ. 14b; Bacher, "Ag. Tan." ii. 385). Nehardea emerges clearly into the light of history at the end of the tannaitic period. Shela's school was then prominent, and served to pave the way for the activity of the Babylonian academies. Samuel, whose father, Abba b. Abba, was an authority in Nehardea, established the reputation of its academy, while Rab, who likewise taught there for a time, made Sura, situated on the Euphrates about twenty parasangs from Nehardea, the seat of an academy destined to achieve a still greater reputation. The history of Nehardea is summed up in that of Samuel's activity (see Samuel b. Abba). Soon after his death (254) it was destroyed by Papa b. Neser (Odenathus), in 259; and its place as seat of the second academy was taken by Pumbedita. Nehardea, however, soon regained its importance; for the eminent Naḥman b. Jacob dwelt there. There are several references to his activity (see Ḳid. 70a; B. B. 153a; Ket. 97a; Meg. 27b). Raba tells of a walk which he took with Naḥman through the "Shoemaker street," or, according to another version, through the "Scholars' street" (Ḥul. 48b). Certain gates of Nehardea, which even in the time of Samuel were so far covered with earth that they could not be closed, were uncovered by Naḥman ('Er. 6b). Two sentences in which Naḥman designates Nehardea as "Babel" have been handed down (B. Ḳ. 83a; B. B. 145a). Sheshet also dwelt there temporarily (Ned. 78a). According to a statement dating from the fourth century, an amora heard in Nehardea certain tannaitic sentences which had until then been unknown to scholars (Shab. 145b; Niddah 21a). Nehardea always remained the residence of a certain number of learned men, some of whom belonged to the school of Maḥuza, which was of considerable prominence at that time, and some to that of Pumbedita. About the middle of the fourth century the famous scholar Ḥama was living at Nehardea; the maxim "By the 'amoraim of Nehardea' Ḥama is meant" (Sanh. 17a) became a canon in the Babylonian schools. Toward the end of the fourth and at the beginning of the fifth century Nehardea again became a center of Babylonian Judaism through Amemar's activity, though this was overshadowed by that of Ashi, the director of the Academy of Sura. It was Ashi who had the seat of the exilarchate, which belonged as an ancient privilege to Nehardea, transferred to Sura (Letter of Sherira Gaon, l.c. i. 32). Amemar attempted in Nehardea to introduce the recitation of the Decalogue into the daily prayer ritual, but was dissuaded from doing so by Ashi. Another of Amemar's liturgical innovations is mentioned in Suk. 55a (on the relation of Ashi to Amemar see Halevy, "Dorot ha-Rishonim," ii. 515 et seq., iii. 68 et seq.). Other scholars of the fourth and fifth centuries who are mentioned in the Talmud as natives of Nehardea are Dimi (Ḥul. 113a), who subsequently presided at Pumbedita as second successor to Ḥama (Letter of Sherira Gaon, l.c. ); Zebid (M. Ḳ. 27b)Naḥman (Ḥul. 95b), Ḥanan (Ḳid. 81b; Niddah 66b), Simai (Sheb. 12b; Mak. 16a). Adda b. Minyomi was called the "judge of Nehardea" (Sanh. 17b). Aḥa of Be-Ḥatim from the vicinity of Nehardea is mentioned by Sherira Gaon (Halevy, l.c. i. 25) as one of the saboraic authorities of the sixth century. Mar R. Ḥanina is mentioned, among the earliest geonim of Pumbedita, as residing at Nehardea at the time of Mohammed. This is the last reference in Jewish history to Nehardea. Benjamin of Tudela, however, mentions the ruins of the synagogue Shaf-Yatib, two days' journey from Sura, and one and one-half from Pumbedita ("Itinerary," ed. Grünhut, p. 64). A few scattered data concerning Nehardea may be added. It was an ancient liturgical custom there to read pericopes from the Hagiographa on Sabbath afternoons(Shab. 116b). The surrounding country was said to be unsafe because of Bedouin robbers (B. B. 36a). An ancient rule of procedure of the court of Nehardea is mentioned in Ket. 87a. Lydda in Palestine, and Nehardea are mentioned in the third century as cities whose inhabitants were proud and ignorant (Yer. Pes. 32a; comp. Bab. Pes. 62b; see Bacher, "Ag. Pal. Amor." i. 60). 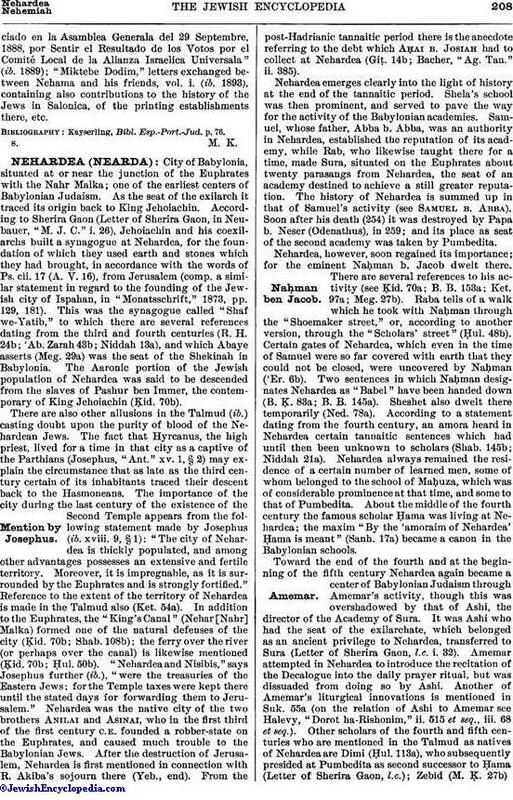 Nehardea is famous in the history of the Masorah because of an ancient tradition relating to the number of verses in the Bible; it is here said that Hamnuna (Bacher, l.c. i. 2) brought this tradition from Nehardea, where he had received it from Naḳḳai (see "M. J. C." i. 174; Strack, "Diḳduḳ Ṭe'amim," p. 56). Certain readings of the Biblical text are characterized by tradition—especially by the Masorah to the Pentateuch Targum (Onḳelos)—as being those of Sura, and certain others as of Nehardea (see Berliner, "Die Massorah zum Targum Onkelos," pp. xiii. et seq., 61-70, Leipsic, 1877).